Great for teachers, nurses and parents, this ceramic bistro mug can be customized for your next special event. Featuring an ear shaped handle, that makes holding it extra comfortable, this mug is perfect for snuggling up with a book and a blanket. 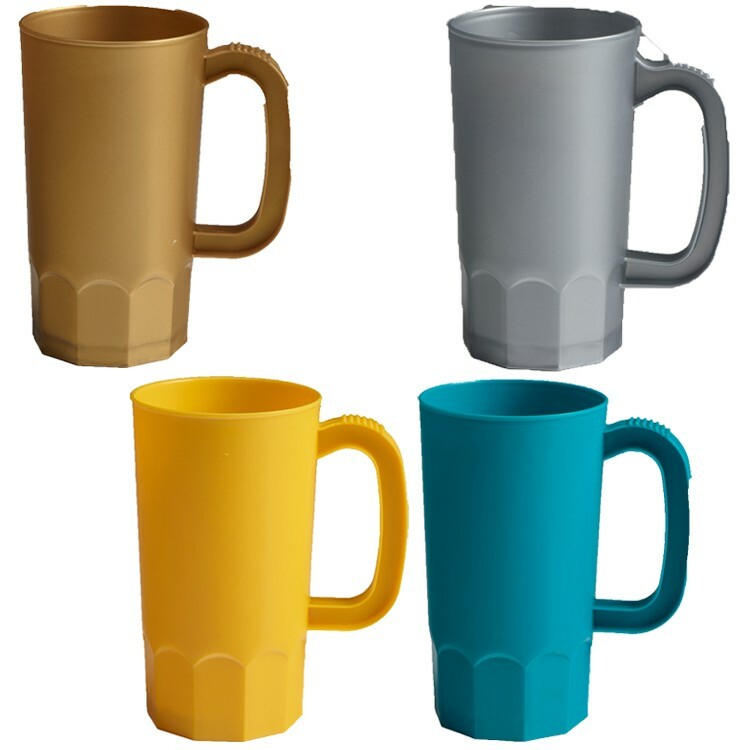 The bistro mug is available in a variety of colors and styles so you can create a product to remember. Holding 16 oz., this mug is sure to become a fast old favorite and kitchen staple for years to come. White in and colored out ceramic mug with a white band design, holds 16 oz. 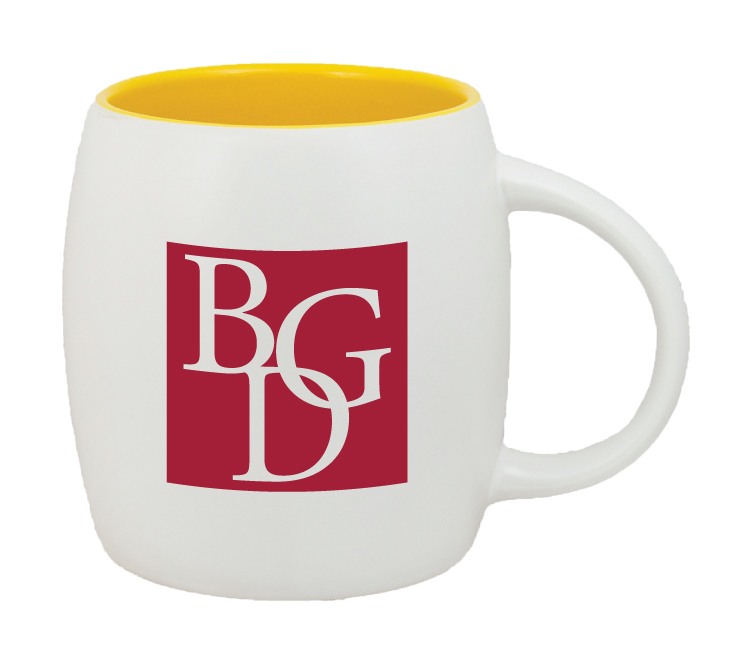 This mug has a sleek shape and offers ample space to showcase your logo! Customize this product via the variety of imprinting options so you can create a one of a kind kitchen staple. 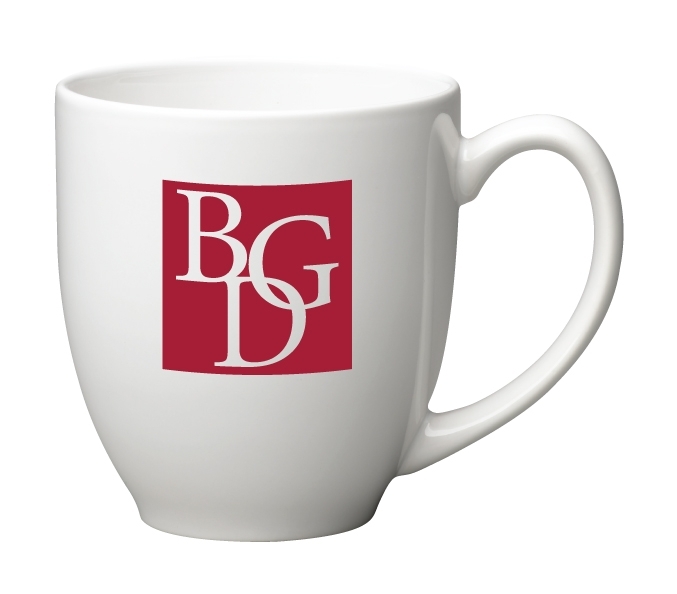 Your valued clients, guests and employees will be reminded of your stellar service every time they go for a cup of Joe! 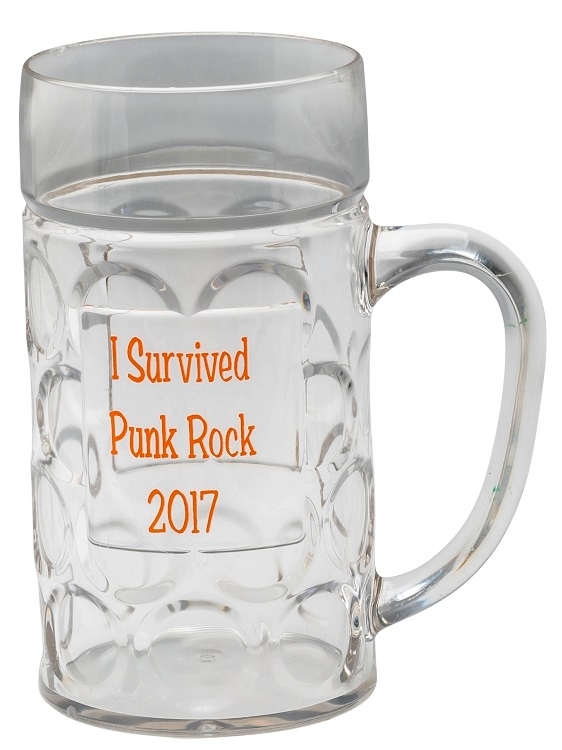 So, distribute this mug at your next conference, meeting, presentation or special event. This ceramic mug features a barrel shape and feels comfortable in your hands. 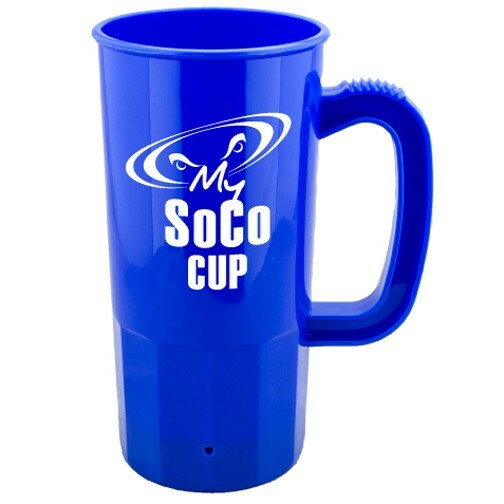 Holding 16 oz., this mug comes in a variety of colors to choose from and can be customized via numerous imprinting choices so you can create a one of a kind promotion that is sure to be appreciated for years to come by your valued employees, clients and guests. 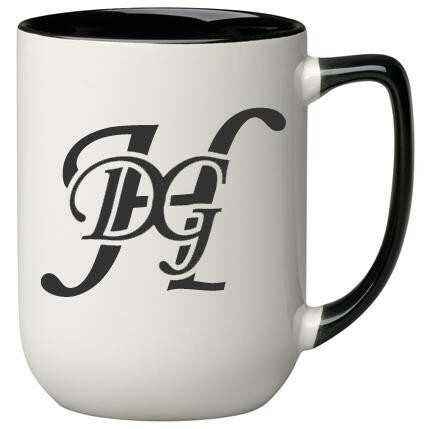 Customize this rounded mug for your next special event. Great for teachers, nurses and parents, this ceramic mocha mug can be customized for your next special event. Featuring an ear shaped handle, that makes holding it extra comfortable, this mug is perfect for snuggling up with a book and a blanket. 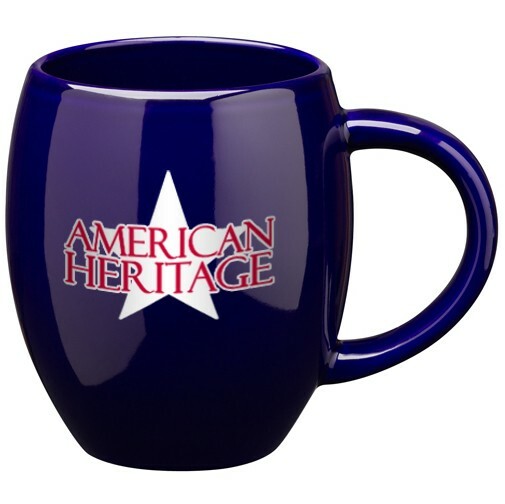 The mocha mug is available in a variety of colors so you can create a product to remember. 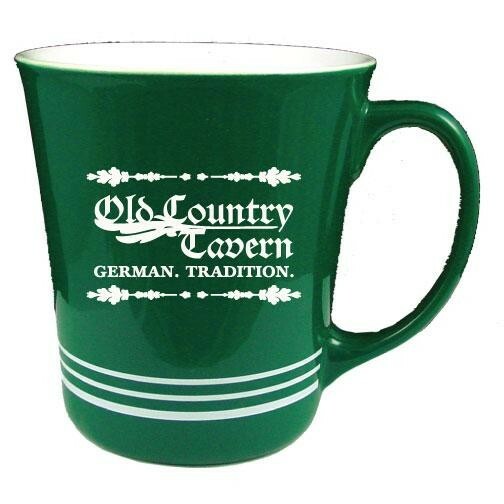 Holding 17 oz., this mug is sure to become a fast old favorite for events and kitchen staple for years to come. 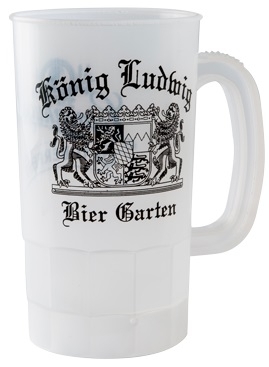 Ideal for Company Parties, Oktoberfest, Colleges and most any Outdoor Event! 32 oz. 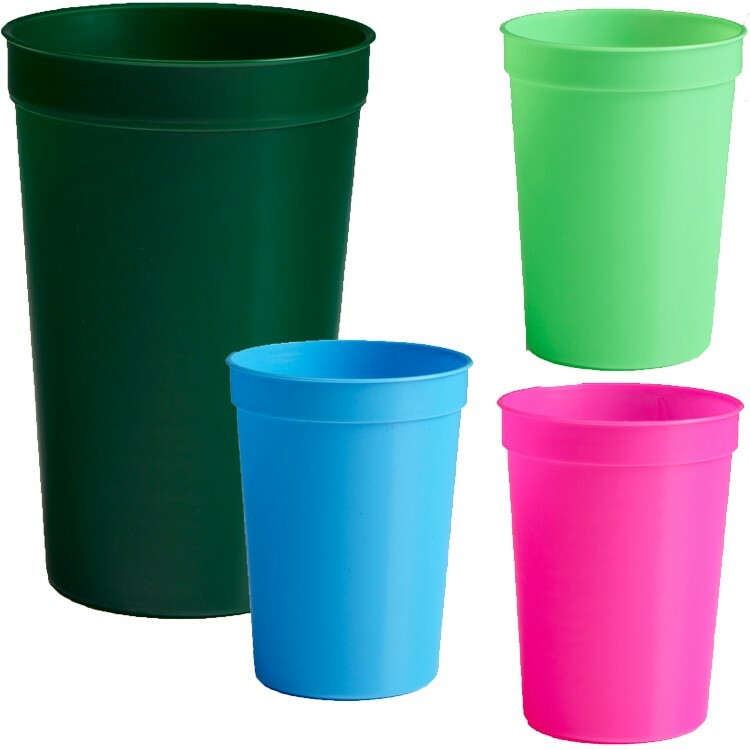 Made in USA Unbreakable & Stackable Plastic Stein made with BPA free polypropylene plastic for strength and durability. Available in 5 colors. 16 oz. 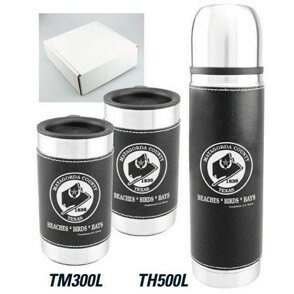 all stainless vacuum sealed thermos with black leather wrap & 2 coffee mugs that are 10 oz. 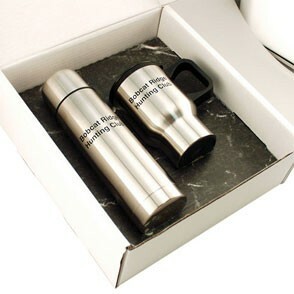 stainless steel tumbler coffee cups with black leather wrap in a white gift box. This thermos holds up to 16 oz. of your favorite hot or cold beverages. This stainless steel leather wrapped gift set is great for truck drivers, hunters, commuters, corporate executives & more. 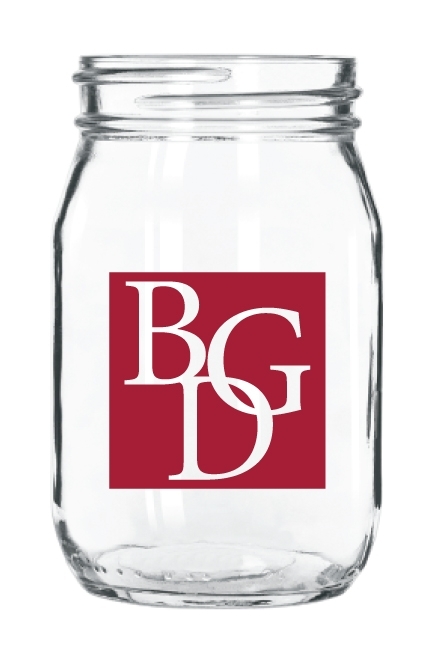 Add your logo or message to this beverage holder gift set and really make your next event memorable. 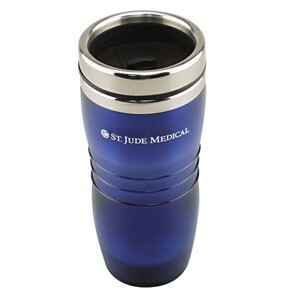 This 14oz acrylic, matte finish, spill resistant, tumbler has a stainless steel liner which will keep your beverage hot. The insulated coffee mug is a great gift for anyone who travels and can be personalized to promote your company, organization or business. 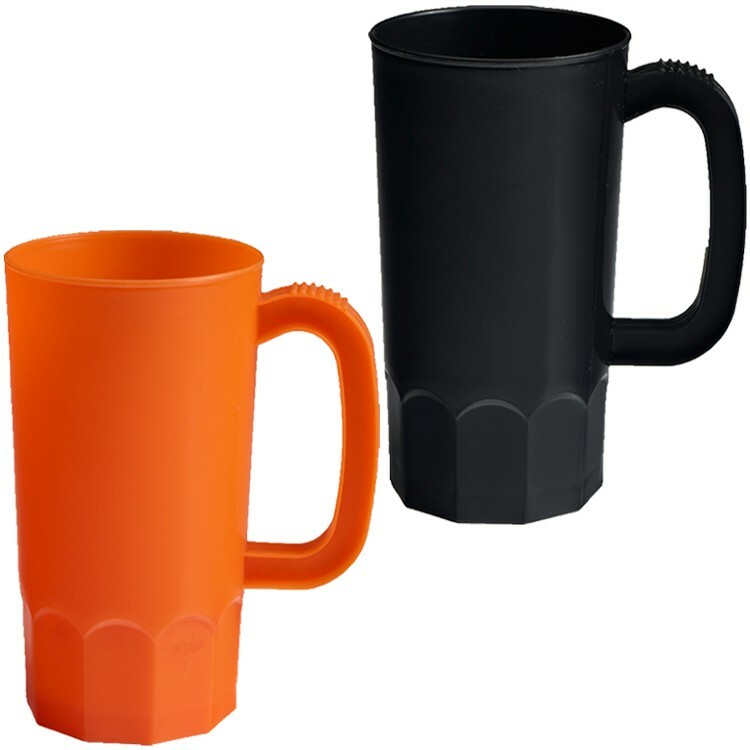 The coffee cup has a tapered bottom that will fit in most drink consoles. However, this product is not dishwasher safe. 16 oz. vacuum sealed stainless steel thermos with a removable drinking coffee cup and lid & 16 oz. stainless travel coffee mug with plastic liner, D style plastic handle, thumb rest, removable lid and thumb slide closure to help prevent spills all in a white unprinted gift box. Free carry case for the thermos! 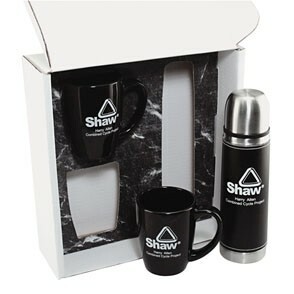 A great corporate executive gift set for your hot or cold beverages.  Thermos and ceramic coffee mug gift set includes a 16 oz. black leather wrap vacuum sealed stainless steel thermos with a removable drinking coffee cup / lid plus two 11 oz. 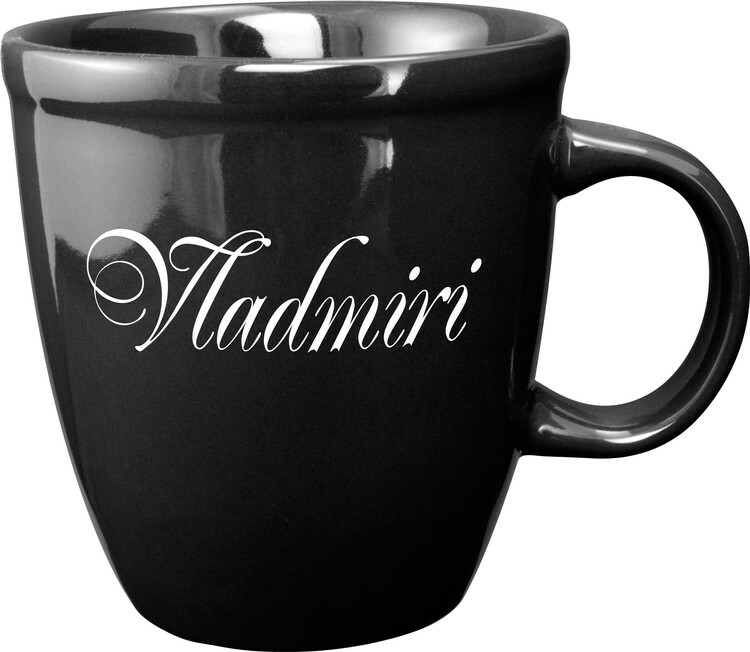 black ceramic mugs with a tapered shape in a white unprinted gift box with. Add your logo or message to this hot or cold beverage holder gift set and really make your next event memorable. This highly stylish gift set is perfect for corporate executives, business clients & many more. 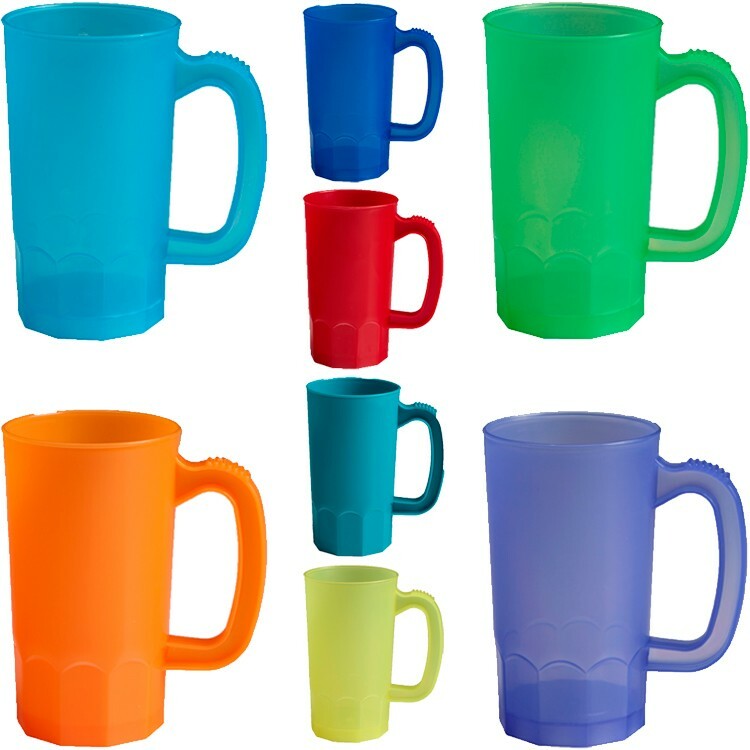 13 oz Glacier Mug - Tinted 13oz cup with C-handle. 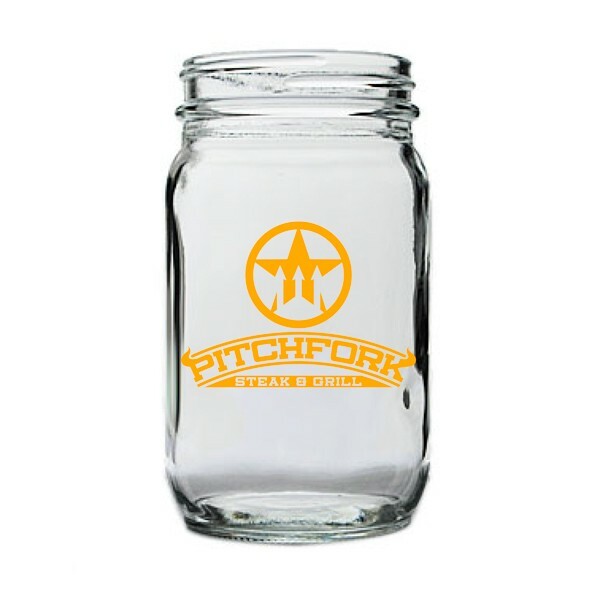 This top quality, heavy duty glass is perfect for weddings, restaurants, social organizations, festivals, taverns & more. Step it up a notch by adding gold or platinum accents. 22 oz. 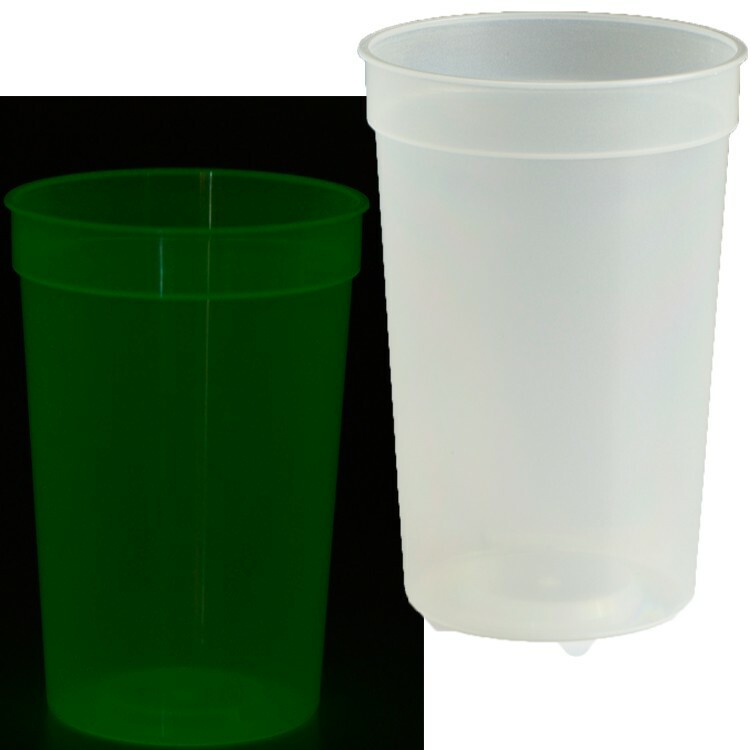 Stadium Cup - USA Made - BPA Free - Glow In The Dark Classic Stadium Cup Glow In The Dark 22 oz Size Also Available in 12oz, 16 oz, 24 oz, 32 oz Many Different Cup Colors Available USA Made All Materials are FDA Approved Prop 65 Compliant Imprint Size: 4" W x 4" H per Side Wrap: 8.625" W x 4" H Colors: Glow In The Dark Solid Colors see Item NT289 Translucent Colors: See Item NT291 Optional White Flat Lid: Add $0.10 (v) Flyer Disc Lid in Black, Blue, Red, White Add $0.20 (v) Whistle Straw Add $0.10 (v) Includes a 1 Color Imprint, 1 or 2 Sides or Wrap Each Additional Imprint Color: Add $0.35 (v) plus Setup ( up to 1,000 pcs ) 2,500 pcs and up add $0.20 (v) plus Setup No Charge PMS Color Match for Imprint - As Close As Possible Production Time: 7-10 Working Days from Proof Approval, Call for Rush Availability FOB: 55044 41 lbs per 500 pc 15" x 18" x 22"
Mugs are an ideal promotional item for hospitals, schools and corporations alike. 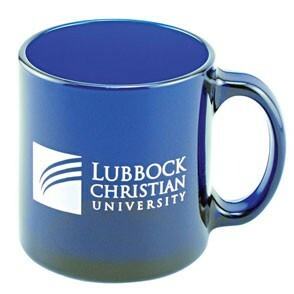 Available in a variety of unique colors, this ceramic latte mug features a unique shape and is the perfect product to customize for your next promotional event. 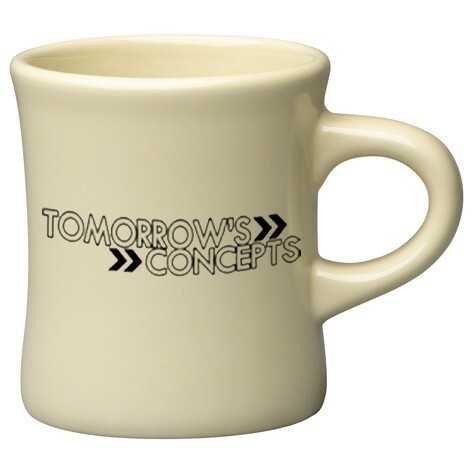 Holding 12 oz., this mug has virtually unlimited imprinting and styling options to choose from so you can create a product that is truly unique and tailored to your needs. This vintage style diner mug can be customized to your exact specifications and has endless personalization and style options to choose from. 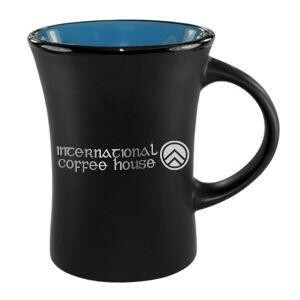 Holding 10 oz., this black ceramic mug is sure to be a hit with your valued guests and clients whether you're promoting a coffee shop, bookstore or hotel. This ceramic mug features a barrel shape and feels comfortable in your hands. 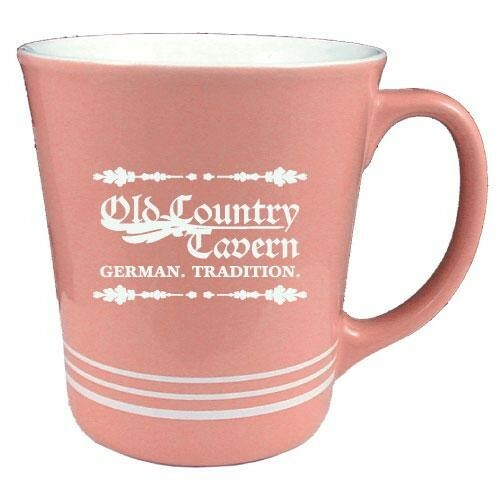 Holding 15 oz., this mug comes in a variety of colors to choose from and can be customized via numerous imprinting choices so you can create a one of a kind promotion that is sure to be appreciated for years to come by your valued employees, clients and guests. 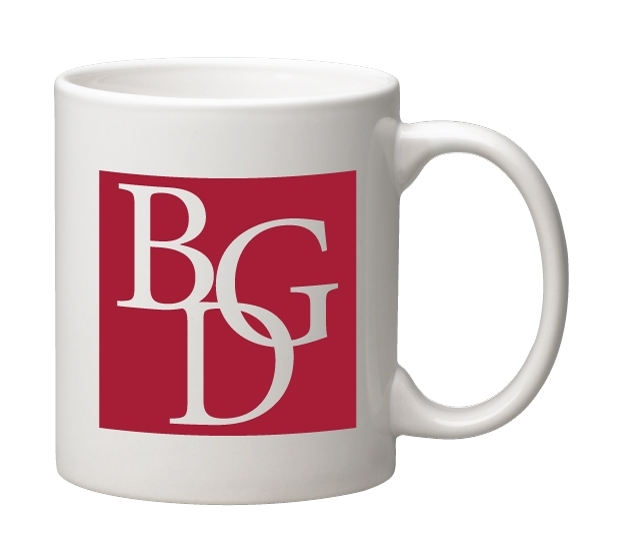 Customize this rounded mug for your next special event. 16 oz. 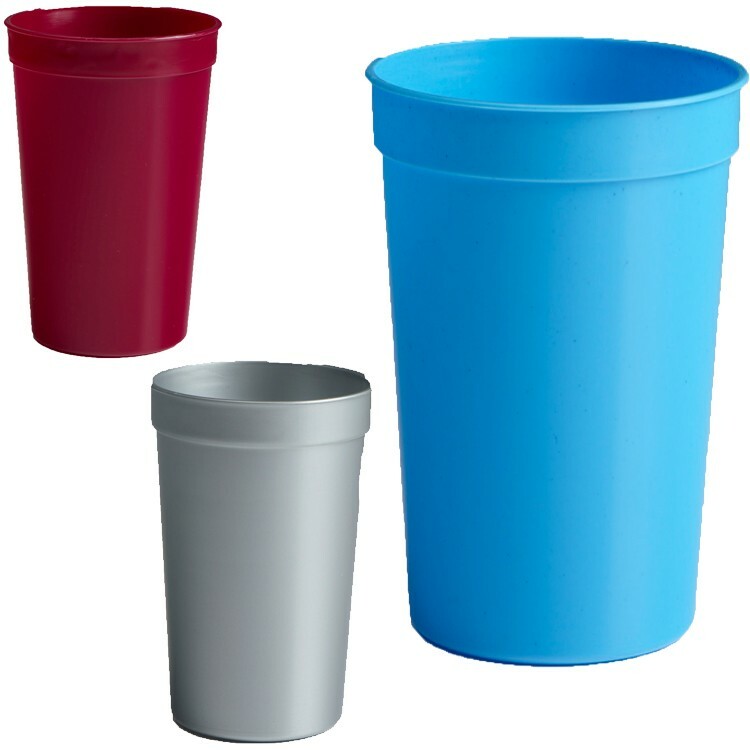 Tall Stadium Cup - USA Made - BPA Free Classic Tall Stadium Cup 16 oz Size Also Available in 12 oz, 22 oz, 24 oz, 32 oz Many Different Cup Colors Available USA Made All Materials are FDA Approved Prop 65 Compliant Size: 5" H x 3 1/2" Top x 2 3/8" Bottom Imprint Size: 3.75" W x 3.5" H per Side Wrap: 8.125” W x 3.5" H Colors: Black, Creme PMS 1205, Forest Green PMS 3435, Frosted, Gold PMS 123, Granite, Grey / Silver, Green PMS 348, Hot Green PMS 802, Hot Pink PMS 225, Light Blue PMS 284, Maroon PMS 222, Natural, Navy Blue PMS 282, Orange PMS 151, Pearl Gold, Pearl Navy Blue, Pearl Teal, Pearl White, Purple PMS 266, Red PMS 186, Royal Blue PMS 287, Silver / Grey, Teal PMS 321, White, Yellow PMS 803 Glow In the Dark see Item NT287 Translucent Colors: See Item NT288 White Flat Lid: Add $0.10 (v) Flyer Disc Lid in Black, Blue, Red, White Add $0.20 (v) Whistle Straw Add $0.10 (v) Includes a 1 Color Imprint, 1 or 2 Sides or Wrap Each Additional Imprint Color: Add $0.35 (v) plus Setup ( up to 1,000 pcs ) 2,500 pcs and up add $0.20 (v) plus Setup No Charge PMS Color Match for Imprint - As Close As Possible Production Time: 7-10 Working Days from Proof Approval, Call for Rush Availability FOB: 55044 35 lbs per 500 pc 14" x 18" x 20"
With a classic white background and matching accent colors on the handle and interior, this ceramic mug adds a splash of color to your marketing campaign. 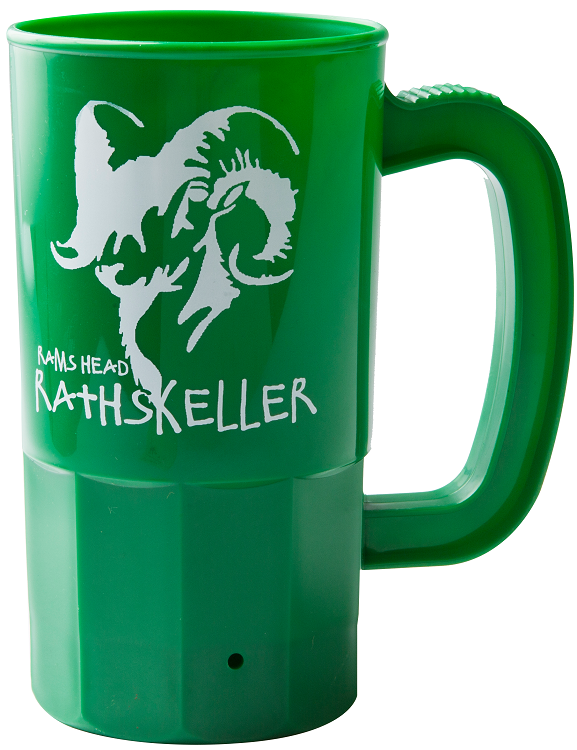 Holding 17 ounces, this mug has several imprinting and customization options for your convenience. 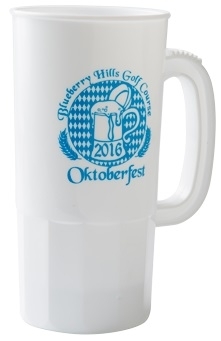 Mugs are a great promotional giveaway for home shows, realtors and insurance agents to give to prospect and valued customers. Search Arlen for all colors available and pricing.